Port of Norrköping is leaving the inner harbour to make room for new homes and a new residential area. Instead we are growing in the Pampus Terminal. A modern and efficient port is valuable to ensure market supply, and with a continuously expansionary port, Norrköping and its surrounding region has a good support for strong future development. 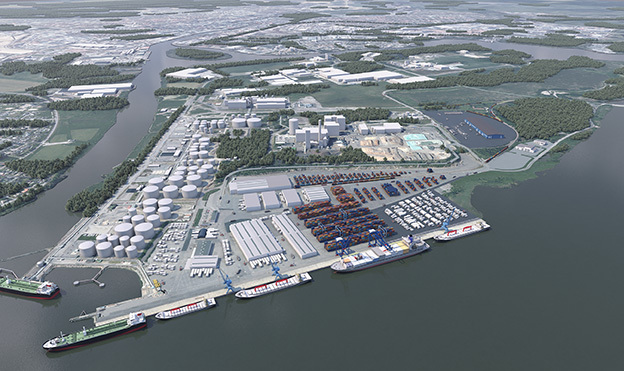 On behalf of the Municipality of Norrköping, we are planning for an expansion of the port operations there, and for a transformation of the Öhman Terminal. This is a part in the conversion of the inner harbour from port and industrial area to residential area. Hence, all port operations will end in the inner parts of the port. • We take full advantage of the infrastructure created and planned around the Pampus Terminal and Händelö area. • We’re shortening transport distances as well as reducing heavy traffic and congestion in the central parts of the city. • We meet future demands on clever logistics solutions, increased freight volumes, larger vessels and more efficient production in the port. • Our own expansion makes room for other valuable development for the city of Norrköping. • We create an environmental, business and socio-economically sustainable port. • We secure the regions and hinterlands need for functioning transportation and strengthens regional business competitiveness. Norrköping is known as one of Sweden’s stronger logistics locations, with a well-developed land- and sea infrastructure. The city is well located, close to large production and consumption areas, and is a strategic location in the growing Baltic Sea region. The port of Norrköping is of great significance for the city and the region as logistics center. The port is also important for the local and regional business, and many companies have located their operations in the region, according to possibilities of efficient transportation. The visualization shows the planned expansion (click for larger view).